“Normally, a management team decides about every step in the process. And once a project reaches the completion stage, they will handle the final negotiations. 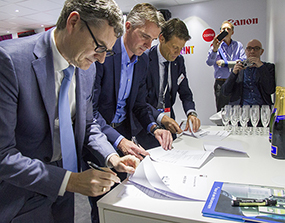 In this case, Frank Alofs, manager at Andi Druk, was more or less given carte blanche and he did it extremely well,” says Frank Huigen, commercial printing director for Canon Nederland. The machine will print, personalize and produce glued and stapled booklets of all sorts and sizes in a single operation. Process 127 meters of paper per minute, two-sided and in full color. Produce 1,000 glued books per hour. Produce 9,000 stapled brochures per hour. Printing on demand; required numbers of copies are guaranteed 100%. Variable printing ability, i.e. ability to personalize printed materials. A 100% guaranteed error-free closed-loop system based on barcode matching. Eliminates the need for multilingual manuals with unnecessarily many languages. No stockpiling and no inventory destruction expenses during overhauls. We invite you to watch this video for a short sneak preview of our future addition. The inkjet production line is scheduled to start operating in November in the new hall to be constructed in the meantime. Obviously, we will keep you up-to-date on all developments. Carefully check our newsletter and social media. Frits Keulen (left) speaking during the official presentation at Drupa. Co-owner Dave Kremer (center) and manager Frank Alofs (right). 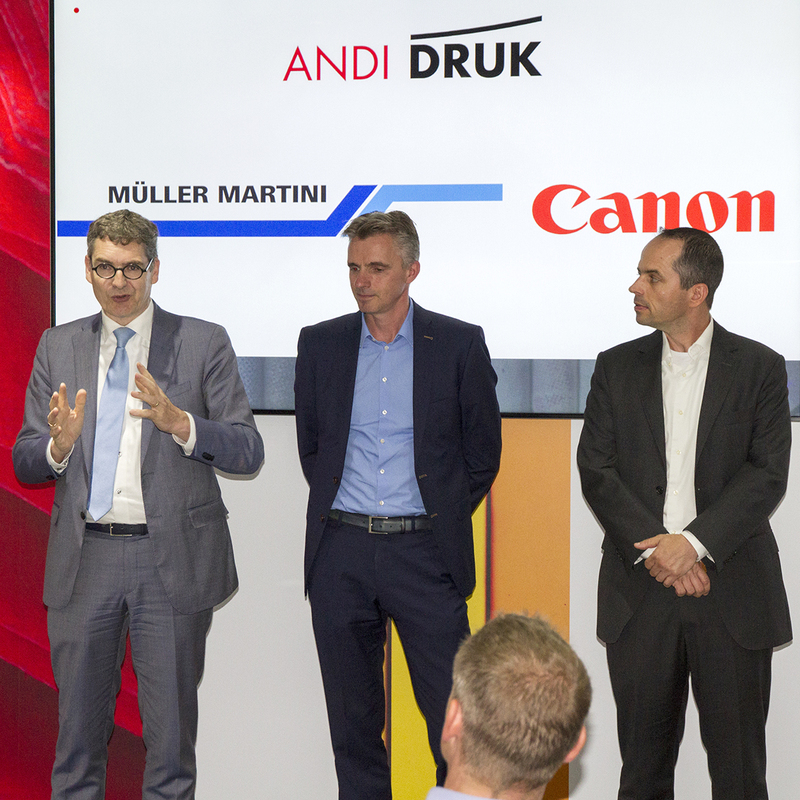 The project team of Andi Druk, Canon and Muller Martini toast together on the cooperation!